Attendance at the HIMSS Interoperability showcase doubled in 2017, and lengthy visits to the redesigned exhibition space showed healthcare decision-makers' interest in more seamless, standards-based data exchange. 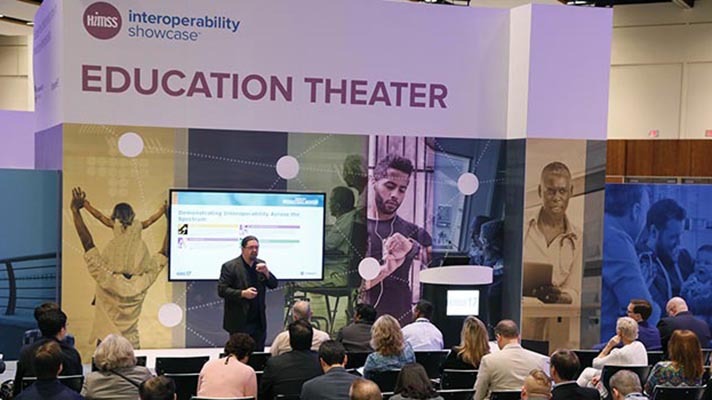 About 7,500 attendees toured the redesigned Interoperability Showcase at the 2017 HIMSS Conference & Exhibition in Orlando this past February – twice as many as the year before. The showcase featured real-world examples of system interoperability as it pertains to surgery and recovery, diabetes management, connected care, federal health architecture initiatives and beyond. What's more, visitors remained at the exhibit for an average of 20 to 60 minutes – far longer than the industry average of seven minutes at most trade show booths. More than two-thirds of the attendees were clinicians, healthcare executives or IT professionals. HIMSS Senior Director of Interoperability Initiatives and Informatics Christel Anderson said the numbers were an object lesson of the industry-wide interest in data exchange, noting that "every stakeholder in the care delivery process" benefits from standards-based, interoperable IT systems. "While work remains to achieve nationwide healthcare interoperability, we experienced increased interest in the showcase from stakeholders across the care spectrum," said Anderson. "Clearly, interoperability education is a top priority for today's healthcare leaders." More than 42,000 health IT professionals, clinicians, executives and vendors attended HIMSS17 in Orlando from Feb. 19-23.